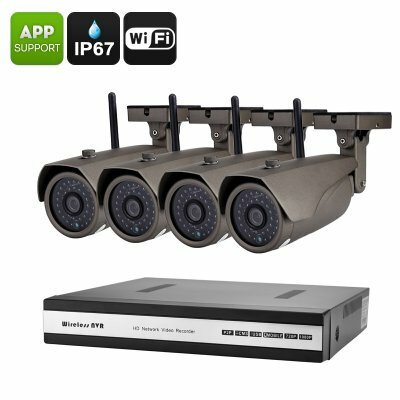 Successfully Added Camnoopy NVR Kit - Four 720P Cameras, 15M Night Vision, IR Cut, 1/4 Inch CMOS Sensor, Remote Access, 90 Degree Viewing Angle to your Shopping Cart. Leave your home with confidence and always be up to date about your property’s latest security status - with this 720P NVR kit from Camnoopy you no longer have to worry about unwanted visitors. No matter where you are, thanks to its mobile application you will always be able to access your security network to ensure that your loved ones and property can enjoy the highest level of safety. Coming with four 90 degree viewing angle cameras this Camnoopy NVR Kit offers the means to protect any property. Featuring a 1/4 inch progressive scanning CMOS image sensor the cameras are capable of recording clear and high digital images up to 720P, enough to clearly recognize a person from a significant distance. Holding IP67 waterproof certification these security cameras are furthermore perfectly capable for indoor and outdoor usage alike. 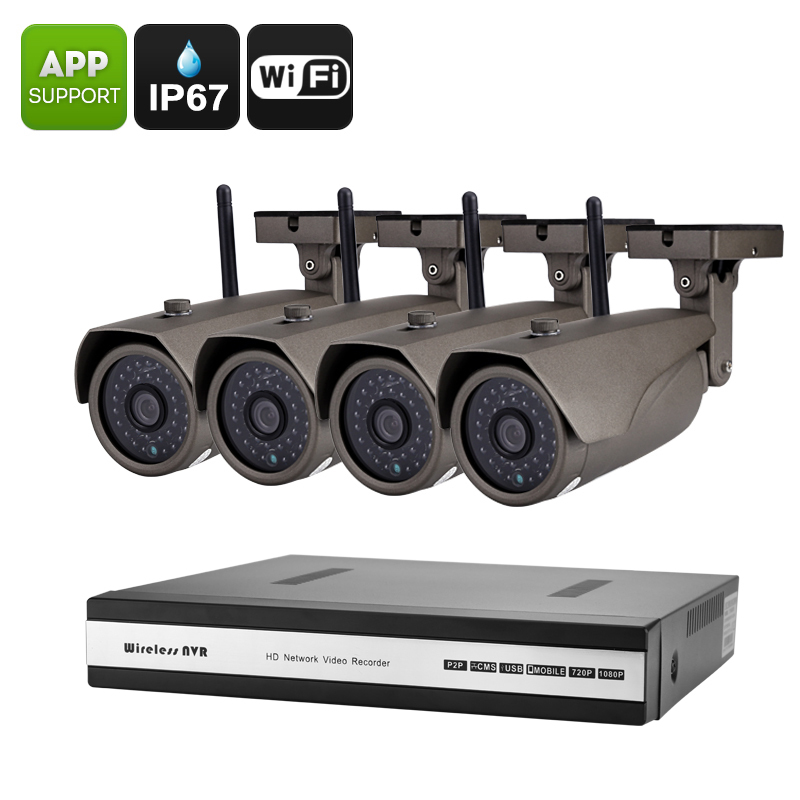 Holding up to 36 IR LEDs this waterproof security camera set is capable of recording HD images at both day and night. Featuring IR cut technology the security cameras automatically switch from regular filming to night vision mode and vice versa when required. When active in night vision mode these Camnoopy security cameras offer up to 15 meters of viewing distance, ensuring you that no matter how dark it gets, no unwanted visitors can get near to your property unseen. The NVR kit’s mobile application, Yoosee, additionally provides you remote access to view your camera’s broadcastings at any given moment. No matter where you are, with these feature you will constantly be up to date about your property’s latest security status. Offering the possibility to insert up to 4TB of external data this NVR kit takes away the fear of running out of storage space any time soon. When necessary the camera can be programmed to record only during certain hours of the day, providing you a way to efficiently handle your storage space. This Camnoopy NVT Kit comes with a 12 months warranty, brought to you by the leader in electronic devices as well as wholesale security systems..
Arabic: - نظام الأمان NVR - Chinese Simplified: - NVR 安全系统 - Czech: - NVR bezpečnostní systém - Dutch: - NVR beveiligingssysteem - French: - Système de sécurité NVR - German: - NVR-Sicherheitssystem - Hebrew: - מערכת האבטחה NVR - Hindi: - NVR सुरक्षा प्रणाली - Hungarian: - NVR biztonsági rendszer - Italian: - Sistema di sicurezza NVR - Japanese: - NVR セキュリティ システム - Korean: - NVR 보안 시스템 - Malay: - Sistem keselamatan NVR - Norwegian Bokmål: - NVR sikkerhetssystem - Romanian: - Sistem de securitate NVR - Russian: - NVR система безопасности - Spanish: - Sistema de seguridad NVR - Thai: - ระบบรักษาความปลอดภัย NVR - Turkish: - NVR güvenlik sistemi - Vietnamese: - Hệ thống an ninh NVR.